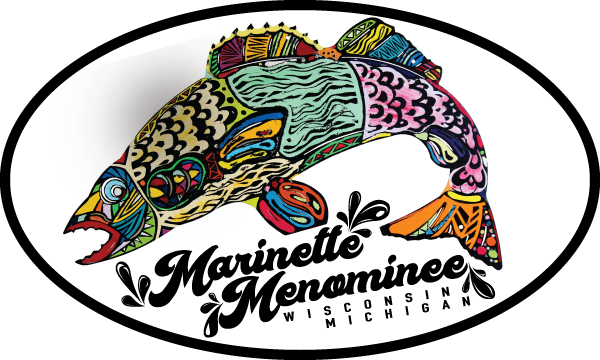 In the spirit of #MyMarinetteMenominee, the Downtown Marinette Action Group is excited to announce several community-wide public art projects that will be open to everyone to participate! These fun, public art opportunities are intended to serve as a tourism draw, showcase our local world-class fishing, drive traffic to local businesses, and deepen the attachment to our communities. 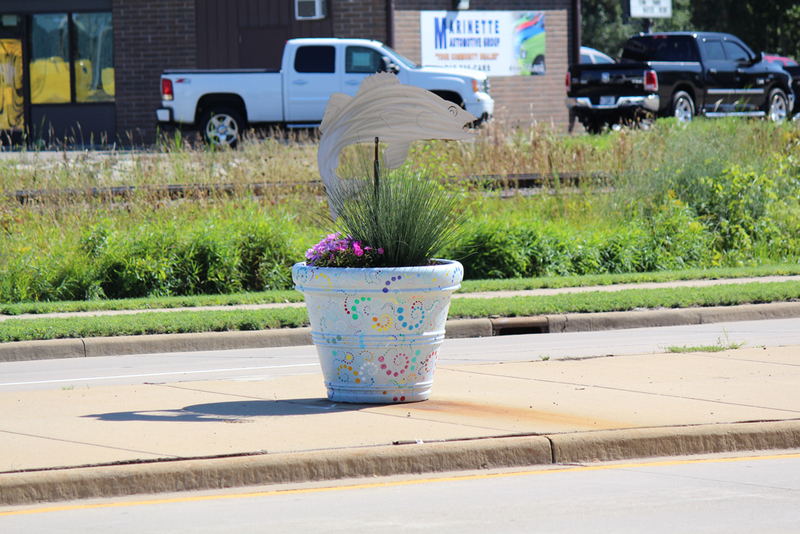 This summer, painted pots, metal perch sculptures, and walleye art benches will be on display throughout our community. We encourage you to participate and to purchase your own piece of public art. 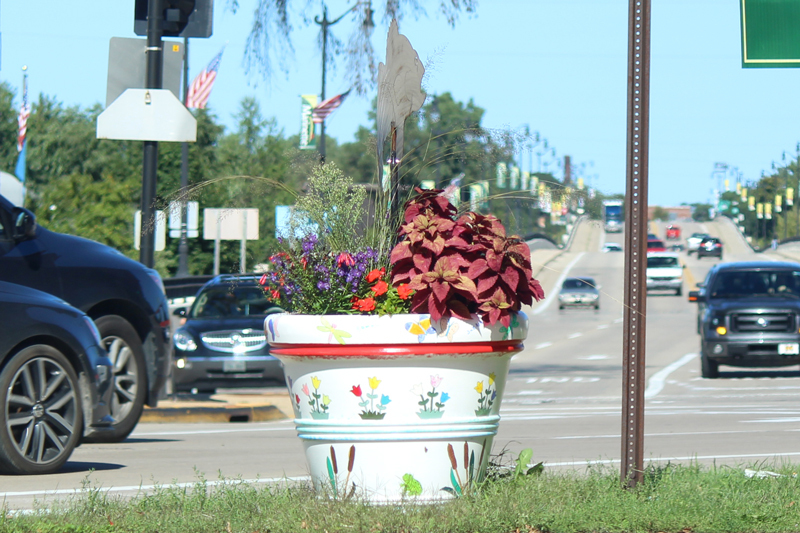 The painted pots will once again line the medians of Marinette. Businesses and individuals are welcome topurchase and decorate pots of their own for use at their business or on privateproperty. 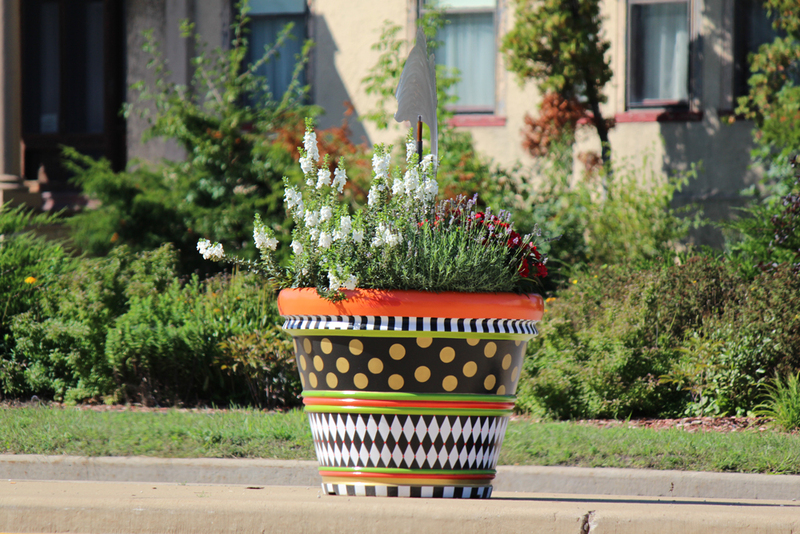 We hope to see many morepainted pots on both sides of the river this summer! 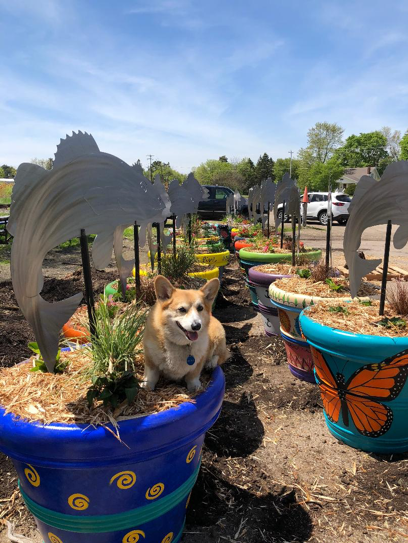 Marinette Farm and Garden will be handling the sales of the pots and will help coordinate getting your pots painted and planted if you need assistance. 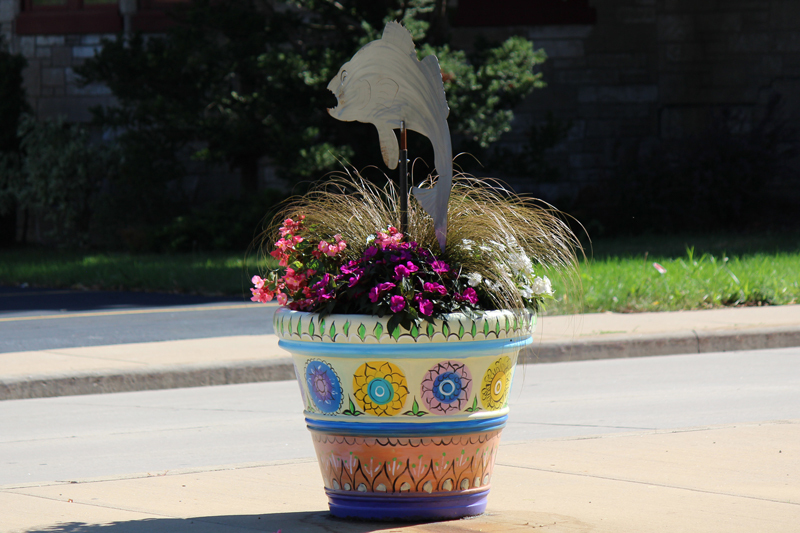 Contact Connie Hass to purchase your pot or for further pricing and details at mfg@newbc.rr.com. 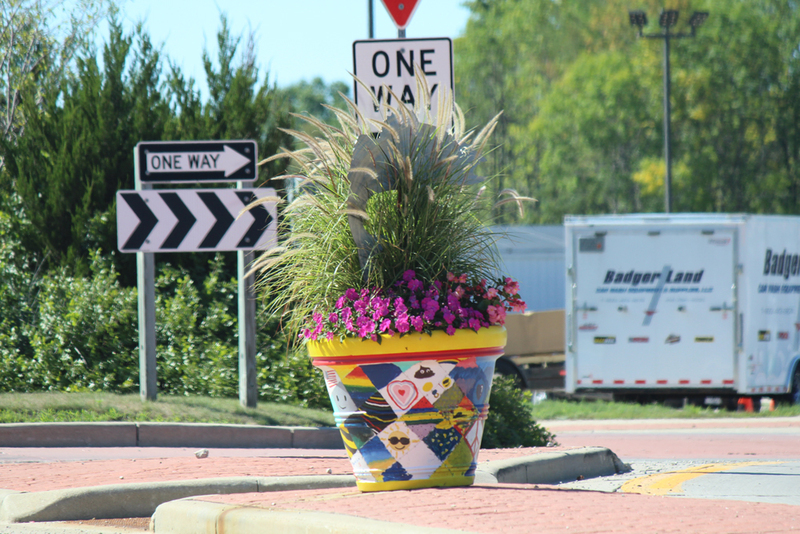 The proceeds raised from the planters will be donated to the Downtown Marinette Action Group for future beautification projects. This summer’s featured fish sculpture is a perch. Each metal perch is approximately 30” x 20”. Primed, unpainted perch sculptures will be sold by the Main Street Antique Mall, 1622 Main Street in Marinette. Please email Kim Brooks at kkbrooks@bellsouth.net for additional info. · The sculptures must be displayed where they can be viewed by the public (inside or outside). · Sculptures can be staked, hung, or mounted to a wall, etc. but must be in compliance with any City ordinances that may apply. · Creativityis all yours and may be unique to your business or profession. Sculptures are not intended to be used for any political or religious purposes and must be appropriate for general public viewing. · Businesses will need to provide an address where the sculpture will be located for mapping and contest information. · No re-sale of this product is allowed. 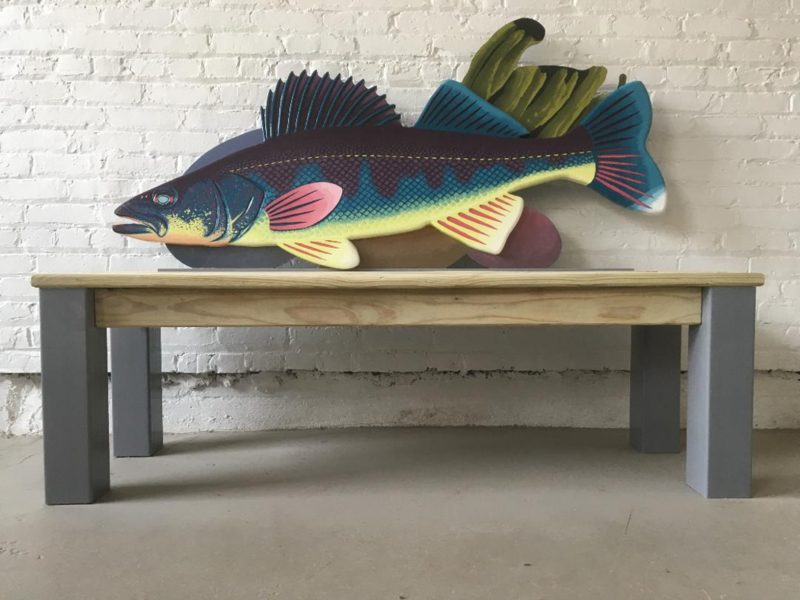 Walleye art benches will be unveiled this summer. 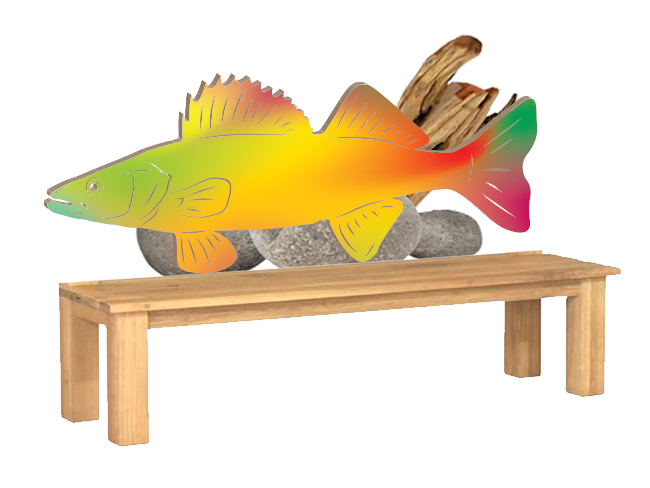 These sculptural art benches have a 5’ solid mahogany walleye as a back rest. The walleyes will be painted by local artists and will adorn our community in the summer months. 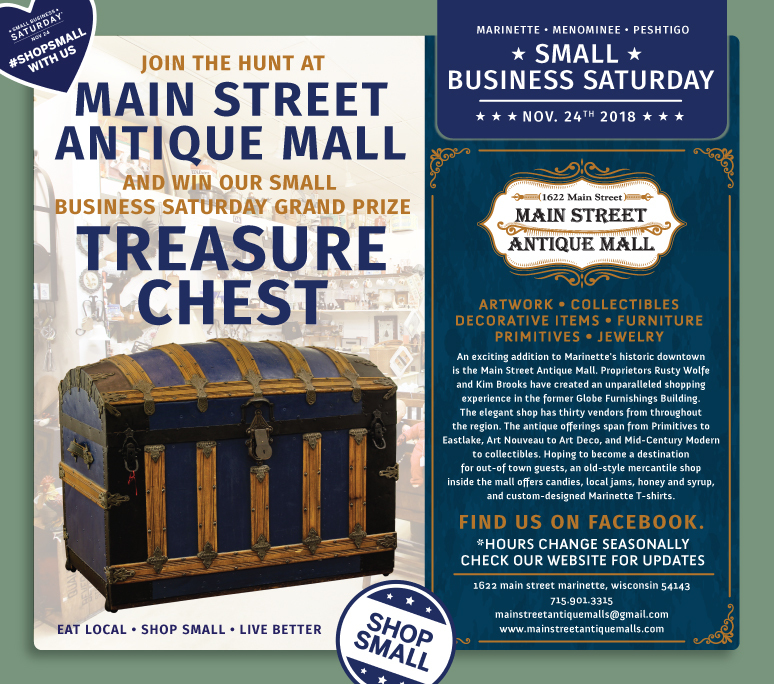 Individuals and businesses can purchase abench for their own property or can sponsor a bench for public placement fromthe Main Street Antique Mall. Each bench costs $2,400.00. We can coordinate you with a participating artist, or you may choose to decorate your bench yourself. Please email Kim Brooks at kkbrooks@bellsouth.net for additional info. Please watch for additional details on all these projects on the #MyMarinetteMenominee Facebook page and www.mandmchamber.com. These art events have been made possible through generous donations from Wildlife Décor, Rusty Wolfe Studios, and the Eagle Herald as well as the efforts of the Marinette Downtown Action Group, an initiative of the Marinette Menominee Area Chamber of Commerce. 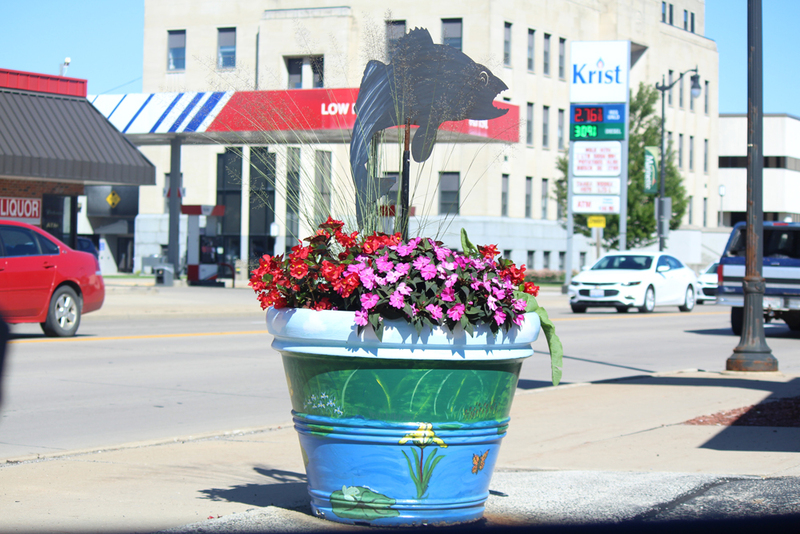 We also want to acknowledge the City of Marinette for its significant contribution to these andother public art projects and to the Department of Public Works for theirconstant care of the Welcome Walleye pots in the city. A special shout out to the hundreds of artists and businesses who make these projects a reality. Discover Our Story of Unity. Take a Few Minutes to Watch Now! The Jingle supports local efforts in Small Business Revolution Push! Small Business Saturday is coming soon. 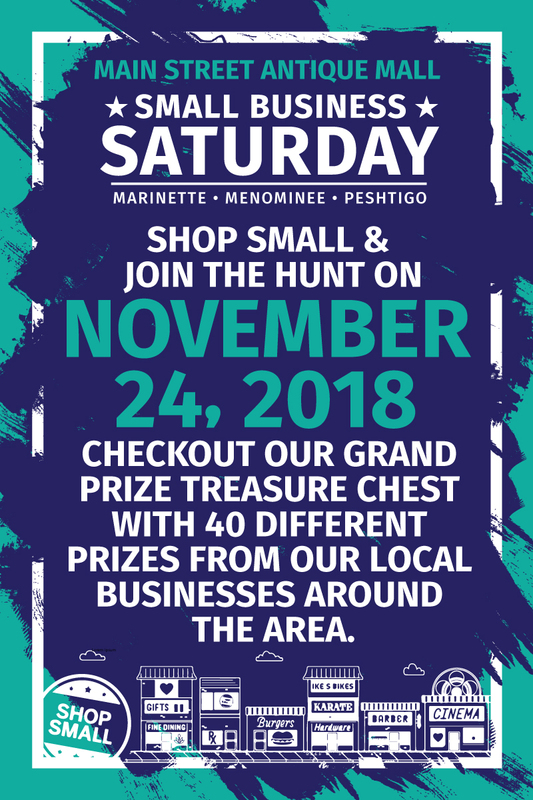 Stop by here at Main Street Antique Mall to see the Grand Prize - Treasure Chest with 32 different prizes from our local businesses in Marinette, Menominee, and Peshtigo. 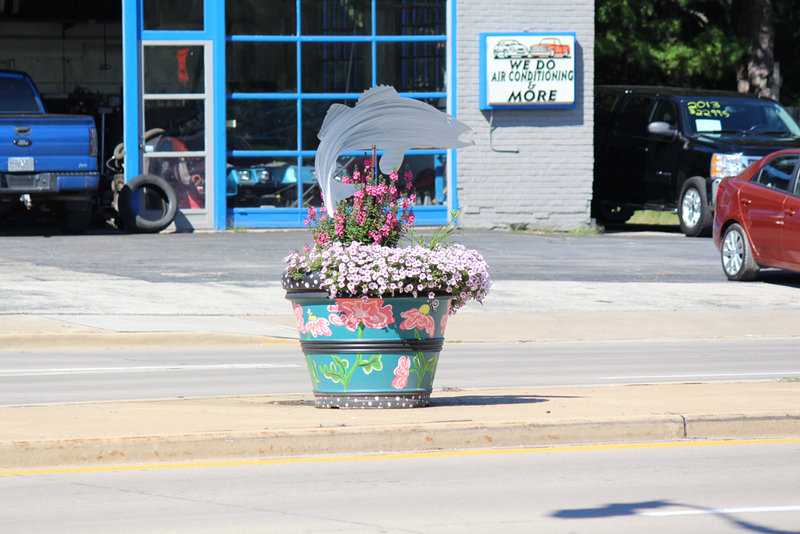 Our first summer we placed 100 metal walleye sculptures into the community.Each was painted by a local artist and the project was generously supported by local businesses. In our second summer, we placed 250 metal trout sculptures in the area. 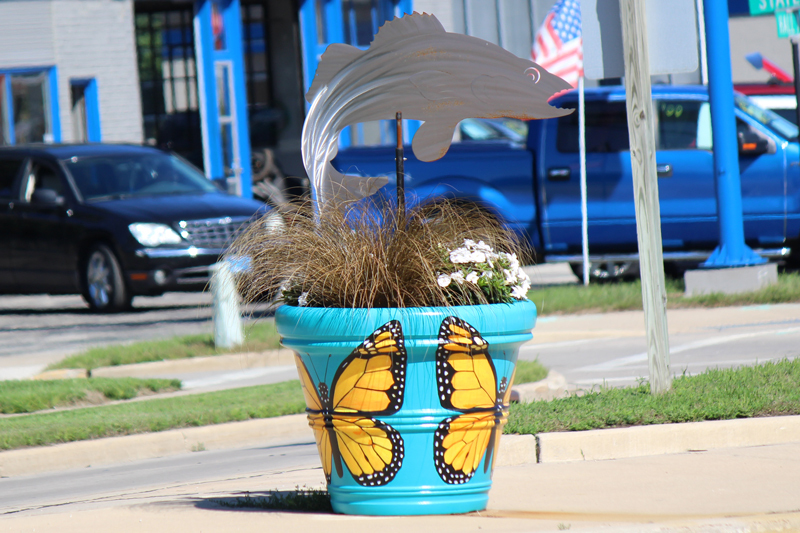 Again, each fish was uniquely painted by local artists and funded by local businesses.We printed and sold "Welcome Walleye" t-shirts at our local Jack's grocery and M & M chamber.Most importantly, Marinette Farm and Garden spearheaded a program to put 28 huge flower pots into the city of Marinette. 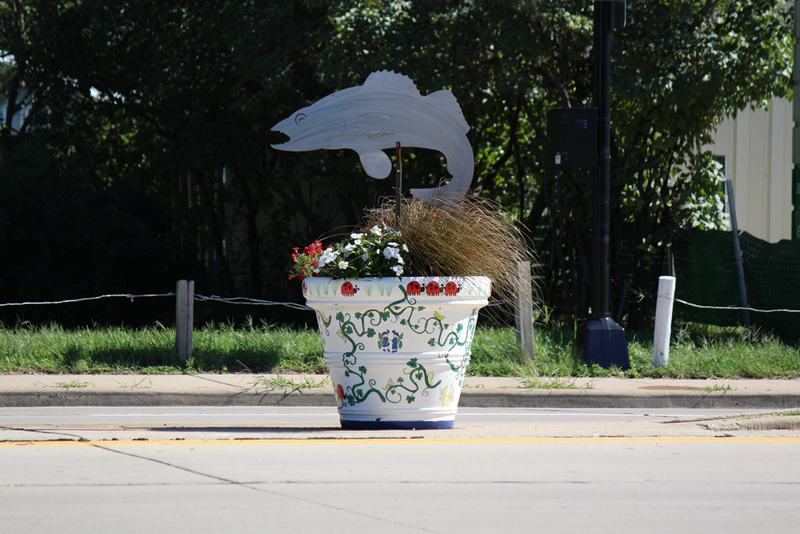 These pots were painted by local artists and groups, were planted with annual flowers, and held a large metal walleye sculpture. The city took great care of these gardens, and it was a delightful addition to the community. 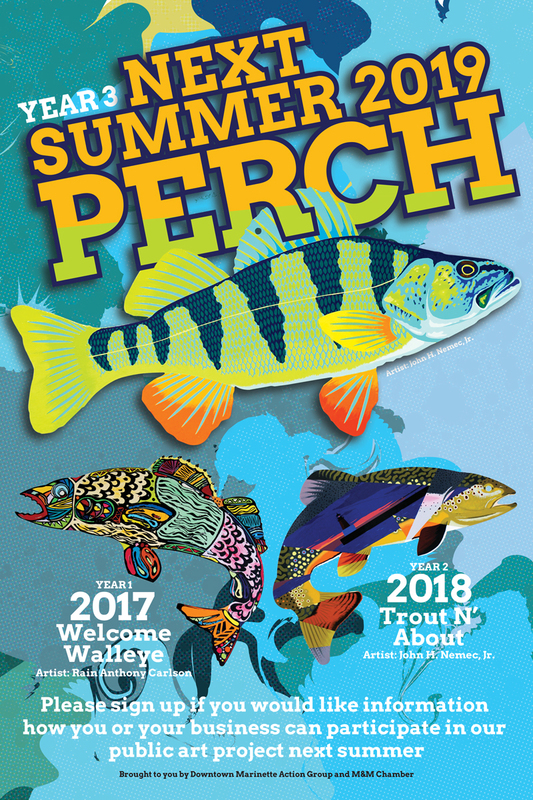 This summer, we look forward to placing as many perch sculptures as possible.We have car decals ready to go .Our biggest effort will be 5' long mahogany walleye benches. These benches are more sculpture than bench, but who says form needs to follow function? 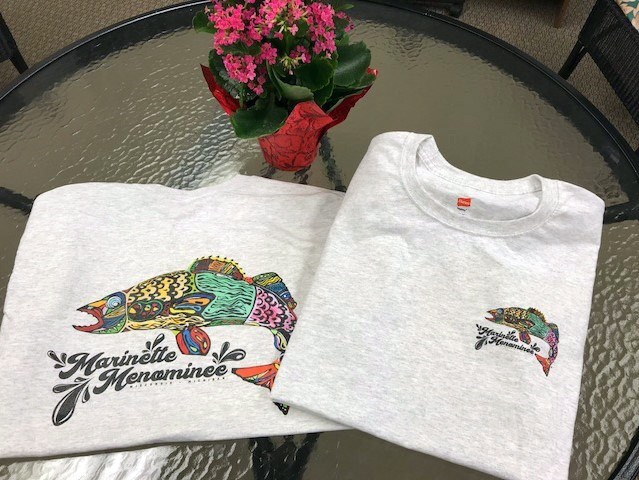 Marinette Menominee T-shirts available now at Jack's Fresh Market in Marinette, 2301 Roosevelt Rd. and Menominee, 1401 8th Ave. Located in the Wine & Spirits section of the store. $15 each. Proceeds from sales will go towards supporting future public art initiatives. Makes a great gift for family & friends! All proceeds from the sale benefit the downtown Marinette Action Group's Public Art Fund.